After jumping out to an early 2-0 lead in the first period against the Eastern Conference leading Pittsburgh Penguins, the New York Islanders let one slip away in overtime. Kyle Okposo scored the Islanders two goals, but the home team could do little else the rest of the way. With :16 seconds remaining in the second period, the Penguins capitalized on a power-play goal by James Neal. This gave the visitors their first goal of the game and would lead to an emotional third period on both sides of the ice. Frans Nielsen was denied by goalie Marc-Andre Fleury on a penalty shot, which would go on to ignite the Penguins. A mere :37 seconds later, with the Penguins on the power play, Sidney Crosby tied the game at two apiece. At 18:13 of the third period, the Islanders had a great opportunity to score the go-ahead goal, after Evgeni Malkin was called for cross checking. Thomas Vanek appeared to be tripped twice in front of the net, while waiting for a deflection, yet play went on. The Islanders fans were in an uproar. Vanek would retaliate and get his own penalty, after slashing defenseman Olli Maatta. The game went on to overtime, when at the 3:44 mark Crosby scored the game-winner and sent the Islanders on to their seventh straight loss. 3 Stars- Marc-Andre Fleury- The Penguins goaltender got off to a rough start in the first period, allowing two goals to Kyle Okposo, but stepped up when the game was on the line. He stopped Frans Nielsen’s penalty shot in the third period and helped kill an Islanders power play in the final 1:47 of the third period. 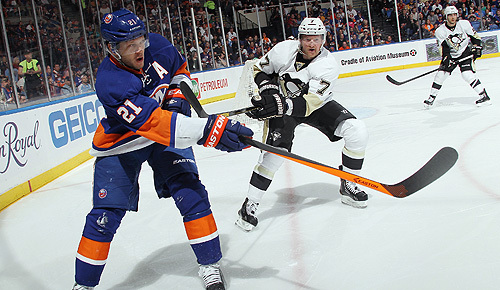 2 Stars- Kyle Okposo- Okposo got the Islanders off to a strong start with his two goals in the first period. 1 Star- Sidney Crosby- Sid “The Kid” leads his team to victory with the game-tying and later game-winning goal in overtime.